Some indications as to where (m)4/3 might be going. It seems that as was always probable, Olympus and Panasonic are going in different directions. Though from the second interview, trying to work out where Olympus are going is not easy, with a series of fairly non-committal answers. Though much of both of these interviews could be lost in translation. Some things do emerge. Firstly the new Panasonic (16MP) sensor is seemingly reserved for the GH2 and won't be making it across to either other Panasonic models or indeed to Olympus. The current GH1 sensor isn't in any other camera either, so the pattern is repeated. The second is that the future of 4/3 as opposed to m4/3 is uncertain. Who knows what will happen? However there was the point made that lenses last longer than cameras. Fortunately many 4/3 lenses will work very well with m4/3 and at least have some kind of future there. Since my favourite lens is a 4/3 lens and I have a couple more bought S/H arriving today I have more than a passing interest in this. Neither the 4/3 or m4/3 mounts strike me as having the longevity of the Nikon F-Mount, Pentax K-Mount and Leica M-Mount, though there will always probably be adapters available. I would imagine that owners of some of the most expensive Zuiko 4/3 lens may be concerned as to what kind of cameras may be available for them in the future. Do they have to look after their E5 very carefully, or can they expect another model, whether a DSLR or some kind of m4/3 - 4/3 hybrid to appear a year or two down the line? I've always been somewhat disappointed by the 4/3 cameras that Olympus have produced. They are usually well-designed but the sensors have always seemed to produce soft results to me. I would hope that they might be encouraged to take a radical approach to future developments. Would I be alone in thinking that a retro-styled small camera, in the shape of something like a Contax G series with a non-AA Kodak 14 or 16MP 4/3 sensor could be the way to go? Make it compatible with 4/3 and m4/3, which would probably mean its m4/3 with an adapter included. No new lens range needed, a home for all existing lenses and a niche market to aim at. Surely Olympus are aware that they are never going to compete with Nikon, Canon or even Sony in the DSLR market. If they aren't then there's no hope for them. Surely they also realise that people who choose Olympus, whether 4/3 or m4/3 are looking for something a little different. They really aren't looking for a Nikon or Canon substitute. They may also own a DSLR and are looking for a smaller, lighter system. All the buzz about the Fuji X100 at Photokina and the column inches it created gives an idea as to what a market for this might be. We are all aware that Olympus don't do cheap. 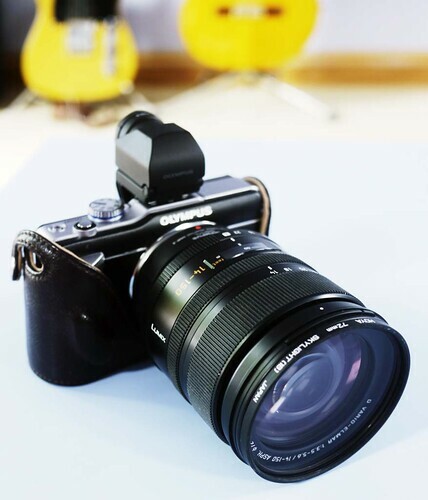 If we're going to have to pay Olympus prices for cameras and lenses why don't they give us something that looks and feels classy and takes terrific pictures? To keep on turning out underperforming, uninspiring DSLR clones isn't going to take them anywhere, is it? The Pens are terrific, a real blend of classic design and modern technology. The 4/3 format still has potential, but it needs a radical re-think, I believe. I'm a potential customer, but currently I'm just restricting my custom to picking up some of the wonderful 4/3 lenses that become available S/H to use on my m4/3 cameras, with a particular view to using them on the forthcoming GH2. I suspect Olympus have no real plan for 4/3 because they probably have no real idea of how it will perform in terms of sales over the next few years. They aren't designing new lenses and they are probably not producing many new ones in their factories. 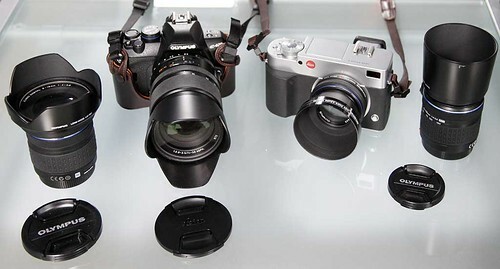 How many are convertible to m4/3 is open to question and some of the "big boys" like the 14-35mm F2 need something substantial to carry them. Maybe the demise of 4/3 could have its benefits and lenses like the 14-35mm would suddenly become ridiculously cheap! However the demise of any system, particularly one that has such quality lenses as 4/3, is a narrowing of choice, and I for one would be disappointed if it disappeared. However sentiment and business don't mix well and if it goes it goes. Hopefully if it does my 14-150mm and other lenses will still be trundling away on the end of whatever I can fit them onto.